Although, the Global Footprint Network released its 2008 Ecological Footprint Atlas last October, I only become aware of it recently while researching for my Relative Hardship posts. I had been wanting to expound on that report, but other pressing posts overwhelmed my effort to finish the exposition. Although the Ecological Footprint concept was created by Mathis Wackernagel and William Rees at the University of British Columbia in the early 1990s, it was only in 2003 when the Global Footprint Network was established to address a need for a metric to sway the ideological debates over the affordability of sustainability. The Ecological Footprint calculates the combined demand for ecological resources wherever they are located and presents them as the global average area needed to support a specific human activity. The method is limited in three ways: Some aspects of sustainability are excluded from its scope; some aspects of demand are hard to quantify; and like any method, errors can occur in the implementation. On the individual level, however, the question is simply: How much land area does it take to support your lifestyle? 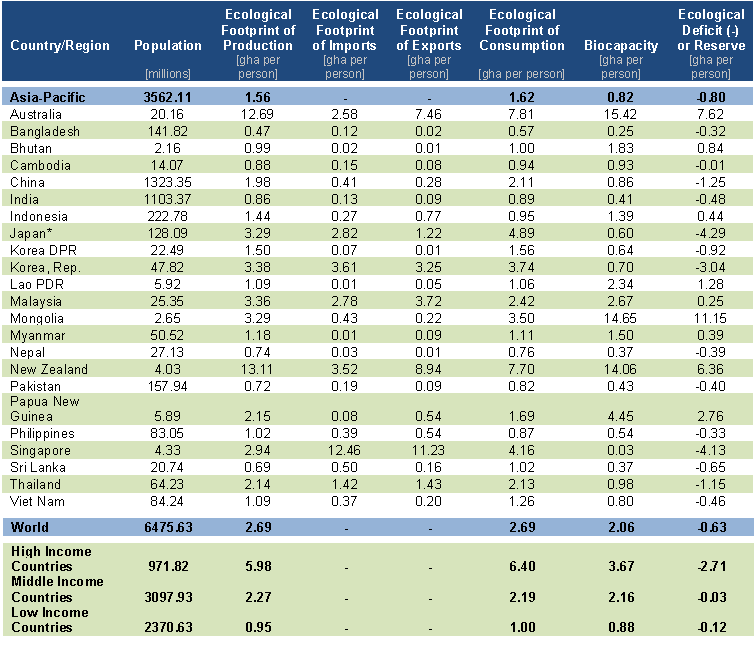 Below is a snapshot for Asia Pacific, taken from Table 1: Per-Person Ecological Footprint of Production, Imports, Exports, and Consumption, by Country, 2005. pp. 41-43. Biocapacity is an aggregated measure of the amount of land available, weighted by the productivity of that land. It represents the ability of the biosphere to produce crops, livestock (pasture), timber products (forest) and fish, as well as to sequester waste such as CO2. In 2005, this amounted to 2.1 global hectares [gha] per person. The production Footprint is the sum of the Footprints for all the resources harvested and all of the waste generated within the defined geographical region. This includes all the area within a country necessary for supporting the actual harvest of primary products (cropland, pasture land, forestland and fishing grounds), the countrys built-up area (roads, factories, cities), and the area needed to absorb all fossil fuel carbon emissions generated within the country. The consumption Footprint (in gha) includes the area needed to produce the materials consumed and the area needed to absorb the waste. This includes their household consumption as well as their collective consumption, such as schools, roads, fire brigades, etc., which serve the household, but may not be directly paid for by the households. An ecological deficit occurs when the Footprint of a population exceeds the biocapacity of the area available to that population. Conversely, an ecological reserve exists when the biocapacity of a region or country exceeds the Footprint of its population. For more information on calculation and methodology, kindly refer to Calculation Methodology for the National Footprint Accounts, 2008 Edition and Guidebook to the 2008 National Footprint Accounts.